Tata Motors has revealed information about a new truck it would be showcasing at the Tata T1 Prima Truck Racing Championship's Season 4, which will be held on March 19, 2017. The all-new T1 Prima race truck will feature an engine with an output of more than 1,000PS, similar to the race trucks which participate in European FIA Truck Racing Championships. The truck will be powered by a 12-litre ISGe engine developed by Tata, in collaboration with Cummins Inc. With an output of 1,040PS at 2,600rpm and 3,500Nm at 1,600-2,200rpm, the new truck features more than twice as much power as the trucks competing in the season 4 of the T1 Prima Truck Racing Championship. The engine drives the rear wheels through a 16-speed ZF gearbox, which helps keep the engine in the power band and puts the power to the wheels quickly. With such output figures at play here, this behemoth is capable of accelerating from 0-160kmph within 10 seconds, claims the company. 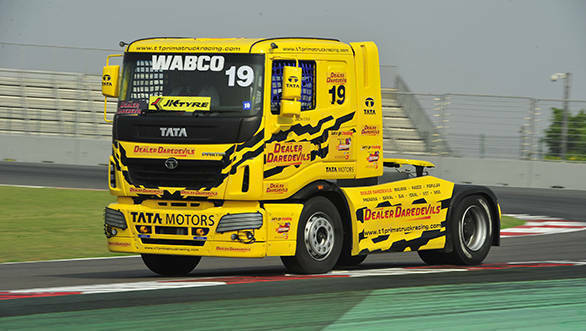 Season 4 of the Tata T1 Prima Truck Racing Championship will be organised at the Madras Motor Sports Club with British Truck Racing Association regulating safety and performance standards. For the first time, the event will have drivers from the European Truck Racing Championship (ETRC). Six drivers from ETRC along with six drivers from the British Truck Racing Championship will be racing in the Pro class. The 1,040PS T1 Prima Truck will not be competing in Season 4 but will only be showcased. However, there is a possibility that this truck might be used in the competition during Season 5 next year. The trucks competing in Season 4 are the same as those in Season 3, with the 370PS/1,550Nm 8.9-litre Cummins ISLe turbo-diesel engine mated to a 9-speed manual gearbox powering the truck. Tags: Tata Trucks | Tata commercial vehicles | Tata truck racing | European Truck Racing Championship | British Truck Racing Championship | Tata-prima | Tata T1 Prima racing championship.